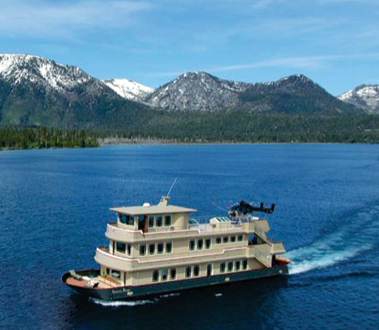 A luxury yacht called the Sierra Rose sank at the dock in Tahoe Keys last Sunday. The three-story yacht sank to the lake bed with several passengers on board. No one was reported injured during the sinking. The top two deck levels remain above the water line. The cause of the sinking is unknown. The Sierra Rose is an 85.7 foot yacht with a gross weight of 222 tons. 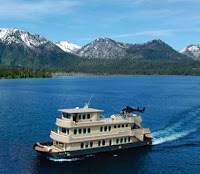 This is one of the largest privately owned boats on the lake. According to the A/P story, the Sierra Rose was valued at $3.2 million dollars. Some of the people at the marina thought of the Sierra Rose as a houseboat, rather than a yacht. The word “ugly” came from some in the marina. The picture suggests a barge-like hull. The cruising speed is listed as.7.5 knots. I would call it a very expensive houseboat.